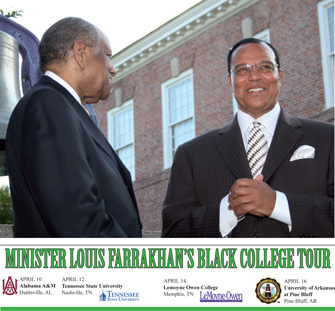 MEMPHIS, Tenn. (FinalCall.com) - The first two stops on the Honorable Minister Louis Farrakhan’s tour of historically Black colleges and universities in the South were marked by externally generated controversy. Some members of the Jewish community placed tremendous pressure on the administrators and students at Alabama A&M aimed at preventing the Minister from addressing them April 10. They were unsuccessful, and he spoke to thousands at AAMU as well as nearby campuses tuning in via internet webcast. Student organizers at Tennessee State University said the administration’s bureaucratic hurdles prevented him from speaking on the Nashville campus. Undeterred, the event was held in a historic church April 12 and the Minister not only addressed students from TSU, but students from nearby Fisk University attended as well. When Minister Farrakhan’s caravan arrived at LeMoyne-Owen College in Memphis April 14, its President Johnny B. Watson was waiting there to officially welcomed him at the site of the Original LeMoyne Bell, a landmark constructed on the campus in 1870. Remarkably, it was the first time he had been publicly welcomed by the president of an HBCU. When Minister Farrakhan stepped into the Bruce Hall Gymnasium, the students, campus administrators, and dignitaries from the greater Memphis area warmly received him with a standing ovation and cheers. 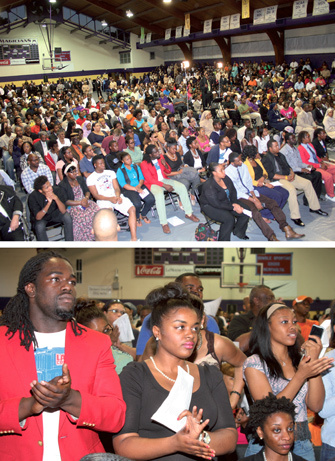 LeMoyne-Owen's Bruce Hall gymnasium was filled for Minister Farrakhan's message April 14. Earlier that morning, the Minister sat for an enlightening 45-minute interview with student journalist Twana Coleman of the LeMoyne-Owen campus newspaper The Magician. Owen Student Government Association, led by its president SimmieRay L. Dinkins, who said “without reservation or hesitation” he was proud to have the Minister appear on the campus. The 23-year-old Mr. Dinkins said he had been focused on making this event a reality since November 9, 2011. That was the night he heard Minister Farrakhan speak to the students at Prairie View A&M University. The Nation of Islam’s study group in Southaven, Mississippi sponsored Mr. Dinkins’ trip to the campus in Texas. The energy Mr. Dinkins felt that evening remains with him, and he wanted his peers at LeMoyne-Owen to experience the very same thing. “I can honestly tell you, the power in the words resonated with me, and I still have the chills up my arm today from the words that he spoke there,” said Mr. Dinkins. “I don’t have a script to introduce the man, but I have a heart to love him through the words that I’ve heard,” said Mr. Dinkins. The Minister began by thanking him for his efforts, commending the school’s president Dr. Watson for his strength, and acknowledging the beloved former Memphis Mayor Willie Herenton, who years earlier, presented Minister Farrakhan with the key to the city, much to the chagrin of the city’s Jewish leadership. They tried to force Mr. Herenton to take the key back, however, he stood his ground and would not back down. The Minister said Mr. Herenton was “a strong Black man” for whom, he “would go to bat for in the jungles of East Asia or the ghettoes anywhere in America.” A thunderous applause rang throughout the rafters of the gym when Mr. Herenton’s presence was announced. Prior to his message, Minister Farrakhan received a resolution from Memphis city council member Wanda Halbert, as well as a proclamation from Shelby County commissioner Justin Ford. He used those awards, as well as the conference’s overall theme as the foundation for lessons he would deliver to the students regarding character, integrity, and qualifications for leadership. “My teacher, the Honorable Elijah Muhammad told me that honor is not given until the work is done. The work of freedom, justice and equality for our people continues, so I will take note of these proclamations and wonderful words—not because I’ve done the job—but as encouragement to keep going until God calls me in. And the job still won’t be done, and that’s why I am so happy and honored to be talking to the future leaders of our people,” said the Minister. Despite his tremendous schedule, which included traveling to New York to speak at funeral services for pioneering Black journalist Gil Noble the previous day, the Minister sounded strong throughout his entire message lasting nearly two hours. “As college students, you are supposed to be critical thinkers, so I did not come here today to stir up your emotions, I came to cause you to think,” said Min. Farrakhan. The Minister said deep love of the people and the desire to serve are qualities that any prospective leader must have. Leaders must also rid themselves of vanity and ego. These are impediments to leadership, he said. “If you don’t love, you can’t lead,” said Min. Farrakhan. “We are a people that wear out our leaders,” he added. If one is thin-skinned, unable to be evil spoken of, selfish, or afraid of being rejected by the same people that one is trying to serve, you won’t last very long trying to lead, said the Minister. The Minister also thanked LeMoyne Owen’s administrators and faculty for keeping God in the classrooms as a critical part of the educational process. “Education begins with God and without God you don’t have a true education because everything that you study is based on what God created. If you are not allowed to pray, and God is taken out of the classroom, no wonder the schools are going to hell and taking the children with them,” he added. He challenged both the male and female students to determine what kind of leaders they would be. Would they be the type of leaders that want to be written of well in the press with the goal of having good public relations, or do they want to be effective in making a change? “How does the press treat Farrakhan?” he asked. “It’s a wonder that you gave me all those proclamations,” he said. “If I wanted the press to be kind to me, I would speak nice words, soft words, tickle your ears with words,” he added. “And what kind of woman are you going to be?” he asked. “With your skirt so short you can’t sit down comfortably.” He reminded the audience that the women around Jesus, even in the movies, were covered. None of them wore miniskirts, or clothing so tight that every curve was seen. This is one of the reasons men lack respect women. Instead of being forced to act like men, the men are acting like dogs, attracted to women showing their bodies and giving up their virtue easily. “Dogs don’t get married,” said the Minister. The Minister added that a leader has to have strong character, able to resist temptation. He used himself as an example describing how he was offered millions by those in the Arab world to stop preaching the Teachings of the Honorable Elijah Muhammad. He rejected them and continued to rebuild the work of his teacher on the foundation he left behind. A person who leads must also struggle for selflessness because any degree of self in a leader can be used by Satan to corrupt them and bring them down. “When you are devoid of self, you make a vacuum for God to come in,” said the Minister. “There’s too much vanity in leaders,” he added. As he delivered important knowledge to the students about their origins, their great past, and how Blacks have fallen into such a wretched condition, he pulled out the book, “The Secret Relationship Between Blacks and Jews” Volume 2 and encouraged them to get it. Jewish critics have called the book “a pack of lies” however none have challenged the research—taken primarily from Jewish historical sources—contained in the book. He continued, “You’re never going to come out and confront us, because we’ve got your history. We know you from the beginning! We’ve called you out! If we are liars, then all you Black people stand on the side and you bring out their scholars and we’ll sit down and argue, and they don’t have an argument big enough to defeat what we have written for you to read of your own history,” said Minister Farrakhan. Twenty-one-year-old Shenika Holmes, a biology major, chemistry minor, a member of Zeta Phi Beta sorority and “Ms. LeMoyne Owen” for the year 2011-2012, heard the Minister for the very first time April 14. “It was a powerful message, and I believe as a student it was important for me to hear this because it not only motivates me to progress in my education but to progress in helping my community as a whole,” said Ms. Holmes. “I have a responsibility to my people and my community,” she added. “I believe he spoke on everything that was on everybody’s hearts in the audience. It was a blessing having him here and being able to grace this campus,” said Jeremy Fountain a 22-year-old art major, member of Alpha Phi Alpha and member of the delegation welcoming the Minister to the campus. Nation of Islam member Terrika Reliford, a 19-year-old student at Christian Brothers University was overcome by emotion, shedding tears during her brief comments prior to Min. Farrakhan’s message. “Just seeing him here and having him standing right behind me at that time, was very emotional,” she told The Final Call. Naa’irah Muhammad, a junior biology major with a minor in chemistry worked tirelessly to inform her peers of Min. Farrakhan’s desire to speak to them. Once the ball started rolling, nothing would stand in the way of organizers. “We stood together and stayed strong to bring him here,” said Ms. Muhammad. “People were giving us trouble but we knew that some just did not understand or were afraid,” she added. 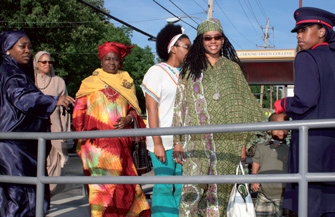 Although Ms. Muhammad is originally from the city of Philadelphia, the Nation of Islam member said she is going to follow Min. Farrakhan’s instructions by purchasing land to build. Mr. Dinkins, a double major in humanities and political science, and a member of Kappa Alpha Psi said he said was very happy with the way the Student Government Association worked together with campus officials to pull off a successful event.